Well, if it isn’t the weekend again, back for more. Football: it’s back. And when the game’s on, you can’t be bothered to man the grill. Here to help—the two Trump hotel chefs behind catering outfit Sol Kitchen. They’ll deliver a four-course feast including short rib sliders and Bacon Bourbon Brownies. You like to outsource your boozy baked goods. 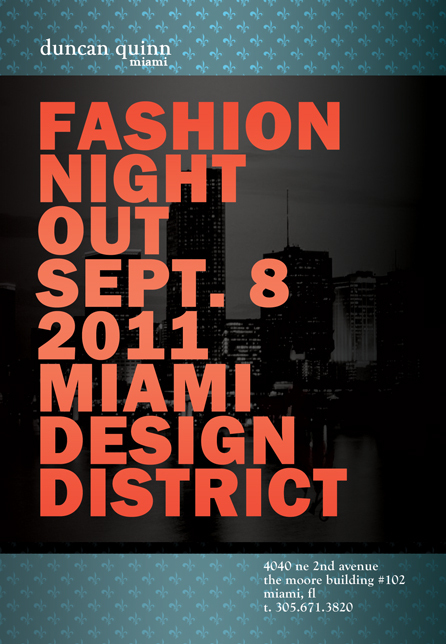 You may get bamboozled into attending shopping parties tonight as part of Fashion’s Night Out. Your play: suggest the Design District, where you’ll duck into Brit designer Duncan Quinn’s store for a few gin cocktails and maybe a bespoke suit fitting or two. You can never stop at just one. So you’ve been courting this multilingual ingenue who’s got a thing for outdoor concerts and eclectic world music. Might have to take her to this performance at Bayfront, where French-Spanish singer Manu Chao will perform his danceable rock-funk in no less than six languages. Funk needs no translation. Like any other Sunday, you’ll be sitting poolside sipping a caipirinha and nibbling on frozen grapes while a butler sprays you with Evian mist. Only this time you’ll be at the Four Seasons, bidding farewell to their weekly summer pool party with this last hurrah. Until next summer, that is. And if you’re more in the mood for homemade pies and fried chicken (and really, when aren’t you), then you’ll want to hit this country-themed hoedown at the Barnacle. Sample 30 homemade pies and then dig into Sustain’s fried chicken thighs. No word yet on fried chicken thigh pie.